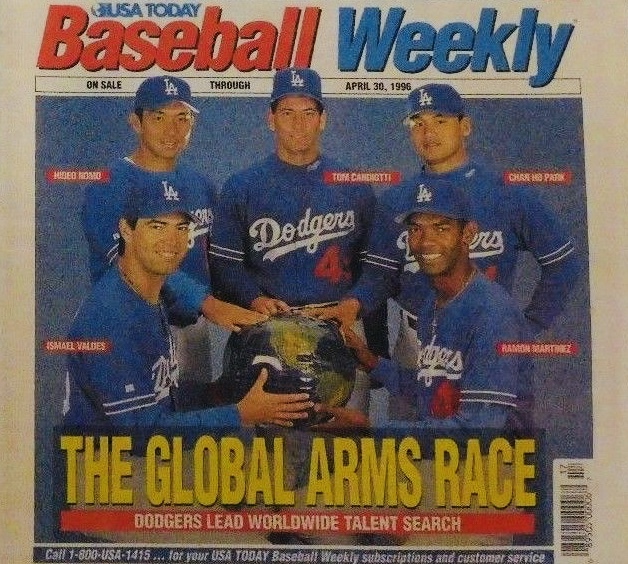 … the 1990s enhanced the Dodger pitching mystique in a specific but meaningful way. Rooted in a far-sighted mentality established decades earlier by Dodger ownership — first Walter O’Malley, then his son, Peter — the Dodgers, and particularly their pitching staff, expanded baseball’s global evolution. The ultimate flags-of-our-nations festival came in 1996, when the Dodger starting rotation featured pitchers from an unprecedented five different countries, with Ramón Martínez (Dominican Republic), Ismael Valdez (Mexico), Chan Ho Park (South Korea), and Hideo Nomo (Japan) joining the lone American, knuckleballer Tom Candiotti. … Simply stated, the Dodgers’ philosophy toward a global game changed baseball, and one needed look no further than the international rotation to see the proof. Martínez, Valdez, Park, and Nomo won’t set foot in the Hall of Fame except as visitors, but each had historic moments and several seasons of sustained excellence. That success, underscored by their unique journeys to Dodger Stadium, makes them a worthy bridge connecting 21st century Dodger pitchers back through time to Hershiser, Valenzuela, Sutton, Koufax, Drysdale, and Newcombe. Beyond their larger collective importance, each of the individual chapters on Martínez, Valdez, Park, and Nomo tell great stories about their subjects. Park spoke with me at length for this book, and his stories are some of my favorites, beginning with the impact of his first visit to Dodger Stadium as a 16-year-old amateur ballplayer from Gongju, South Korea. When the game ended and the stands emptied, Park continued to gaze at that mound as he and his group stuck around. Then before leaving, he went to the Top of the Park gift shop to buy gifts for his hometown friends who had helped raise money for him to go on the trip to the United States. He looked at Dodger keychains, Dodger pencils. Then he saw a shiny blue Dodger jacket hanging on the wall. The cost of the jacket nearly staggered him, but he had a solution. He bought the jacket, and then when he got back to Korea, he passed it around so that everyone could wear it. It was a direct connection to a memory of Dodger Stadium that profoundly affected him. Then comes Ismael Valdez (known during his early playing days as Valdes, before discovering, as he told me, at age 26 that his birth certificate had a “z”). With an adjusted ERA of 115, Valdez is 13th in Dodger history with a minimum of 1,000 innings and sixth among Los Angeles pitchers, trailing only Kershaw, Sandy Koufax, Tommy John, Don Drysdale and Hershiser. He also had a journey to Dodger Stadium unlike any other. In one year, he played in the United States, Mexico, Venezuela and the Dominican Republic — all while he was still 18. Martínez, Park and Valdez all performed well in their Dodger careers, but they were dwarfed in stature by Hideo Nomo. As is the case with Fernando Valenzuela, the phenomenon of Nomonia (as I insist is the proper term) tends to overshadow the pitching itself, but Brothers in Arms does its best to make hay with both. Many of those who were thrilled by Nomo becoming a sensation with the Dodgers beginning in 1995 couldn’t appreciate that he had already been the Next Big Thing once before. In Japan, he was a phenom. Born in Osaka in 1968, Nomo was predisposed to three things — a quiet demeanor, a love of baseball, and a precocious sense of innovation. The combination led to his signature pitching style and success. Originally looking to impress his father, Nomo developed a pitching motion in which, with his pitching hand in his glove, the right-hander stretched his arms high and even behind his head, brought them down to his waist and then up again to shoulder level as he lifted his left knee up, all while pivoting clockwise hard on his right leg — leaning almost impossibly backward, his body nearly in the shape of a 7 — before dropping his pitching arm to knee level as he uncoiled and windmilled home. They’d call him “The Tornado,” and soon he laid waste to opposing batters. As time passes, the International Rotation might tend to be a somewhat forgotten component of the Dodger pitching tradition, but I promise you it’s an essential one that you’ll want to revisit.